Everyone knows that bitter gourd is a wonder vegetable coming with several health benefits. Bitter gourd (bitter melon) is low in calories and rich in phytonutrients. This vegetable is also known as Karavila, Pavakka,Kaippakka, Bitter melon, Bitter cucumber, Carilla gourd, Ampalaya, Karela, Pavel, Parkai, Kugua, Pare, Goya, Kho qua, Faaga, etc. In diabetic patients, bitter gourd reduces blood sugar levels, by regular use. The other benefits include healing of several ailments like colic, fever, anemia, piles, kidney stones, intestinal worms, herpes, ulcers, skin eruptions, etc and also improves digestion. The bitter taste prevents many using it. Here is a recipe, which reduces the bitter taste. 1.Cut the bitter guard into thin rings. 2. Mix all the powders, including salt, with a pinch of water. 3. Add the bitter guard rings into the mixture and mix well, and keep aside for 5 minutes. 4. Heat the oil in a tawa, and then reduce the flame. 5. Add the bitter guard rings one by one into the oil, without touching each other. 6. Increase the flame for almost a minute, and then reduce it. 7. Turn the bitter guard rings one by one. 8. After two minutes, they can be removed to the side of the pan to drain the oil. 9. After two minutes, remove them into a plate. 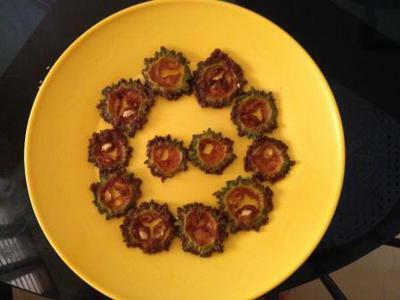 These bitter gourd rings are not very bitter, and can be eaten even without anything. With rice, it is very delicious. Hope you will try it out.